So many people love dolphins, but they don’t know too much about them. Parents who want to teach their kids a little bit about dolphins before they go out on the ocean to look for them, via Dockside Fishing Charters of Va. Beach, can utilize this blog post for some good dolphin facts to share. As one of the more intelligent animals out there, dolphins often act playful to the point where humans have grown fond of them over the years. There was even a show about a lovable dolphin named Flipper some years ago. Indeed, dolphins like to swim along boats, jump out of the water, ride waves, and even interact with people, so they’re easily watchable and overall quite lovable. 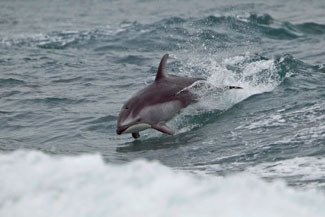 Dolphins use blowholes to breathe air. They’ve got great eyesight and hearing, and communicate with one another using various sounds they make, such as clicks and whistles. Female dolphins are called cows, males are bulls and the kids are calves. It takes between 9 and 17 months for a baby dolphin to be born. Twins are rare. Mostly, just one calf is born to the mom at a time. When a mom gives birth, she takes her baby to the surface of the water so it can get air, taking its first breath. The mom then nurses the calf for up to two years. After that, the calf sticks around its mother for a couple more years until it feels ready to venture out and go off exploring other areas of the ocean. Dolphins live between 40 and 80 years. Generally, dolphin “families” consist of up to 12 living together in what humans call “schools” or “pods.” Dolphins typically travel together looking for food– as few as 5 or as many as 500 swim together at a time! Did you ever wonder what dolphins eat? Generally, they eat fish like mackerel, cod or herring. They’re also known to eat squid, seals, sea lions and turtles. They’re carnivores– meat eaters. The smallest dolphins weigh about 90 pounds, while the largest dolphin species — the orca (aka killer whale!) — can weigh up to a whopping 19,000 pounds! Little ones are four feet long, while the big orcas can be up to 25 feet in length– whoa! The dolphin most familiar to people is the bottlenose dolphin. At about eight feet long, weighing 440 to 660 pounds, these are the ones you’re likely to see off the shores of Virginia Beach in their natural habitat. 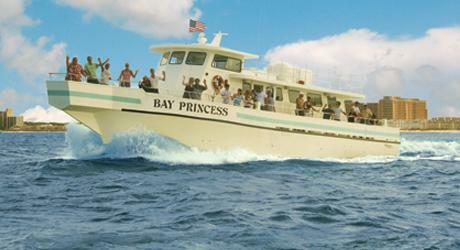 For dolphin watching cruises via Dockside Charters, call 757-481-4545 for more information.